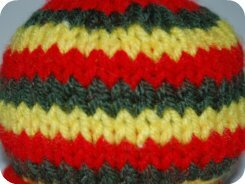 How to knit a reggae hat using Rasta colors. 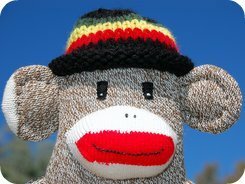 You can knit Rastafarian hats for kids and adults or make a sock monkey toy hat. Sock monkey hat patterns are our specialty. 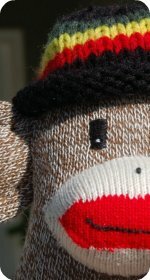 The patterns are really simple and it takes no time at all to knit up a hat, especially when you make a teeny tiny one to fit a small sock monkey head. 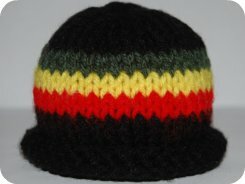 Following the basic roll brim hat pattern , you can place the Rasta colors of red, gold, green and black in a variety of ways. Materials: Size 8 needles, worsted yarn in red, gold, green and black. Cast on 40 stitches with black yarn. Stockinette 10 rows. 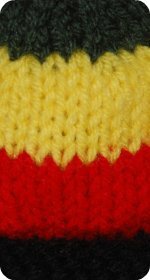 Change to red yarn for rows 11-12, then gold for rows 13-14, and green for rows 15-16. Change back to black yarn stockinette rows 17-18. Knit with black yarn for the remainder of the pattern. The Rasta colors layout can be altered in many ways. By following the basic patterns you can create many different styles. 1: Stockinette 2 rows in red, 2 rows in gold, 2 rows in green. Continue alternating the colors throughout the pattern. 2: Stockinette 6 rows in black, 6 rows in red, 6 rows in gold, 5 rows in green. 3: Stockinette 10 rows in black, 2 rows in red, 2 rows in gold, 2 rows in green, 7 rows in black. Materials: Size 8 needles. 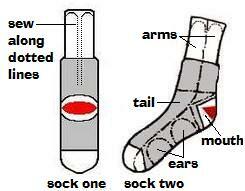 You can use either double pointed needles, circular or straight knitting needles. Black, red, gold and green worsted yarn. Cast on 80 stitches with black yarn. Stockinette 16 rows. Change to red yarn for rows 17-22, then gold for rows 23-28, and green for rows 29-34. Cast on 100 stitches with black yarn. 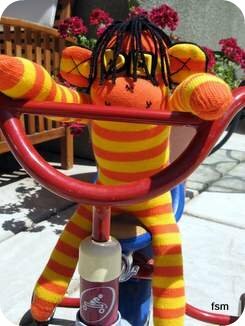 Use thick black or dark brown yarn, or a light yarn if you want blonde dreads. Use thin yarn if you are wanting thin style dreads. 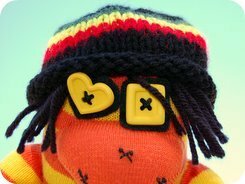 You can either sew the dread-lock yarn to the inside of a knitted Rastafarian hat or sew the yarn directly onto the head (sock toys only, no people). Depends if you want a full time Rasta sock doll or a dress up outfit for one. 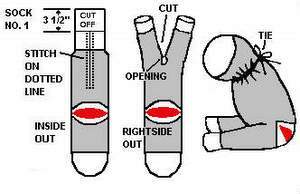 Once the hair is in place, either on a hat or toy, trim each dread-lock to the desired length. Beads can be added. 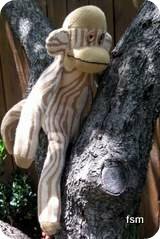 I have made a sock monkey doll with dreadlocks but you can apply this method to any sock animal. A dog with dreadlocks would be pretty cool. Other gear to use when clothing in a rasta style - tie dyed t shirts, cap, bracelets, bag, belt, dresses, hoodies, tams. Black the beautiful people of Africa.